My son moved out of the house about 2 years ago (and he just got married this weekend, I might add), but I haven’t done much to his bedroom since he left. Until now, that is. 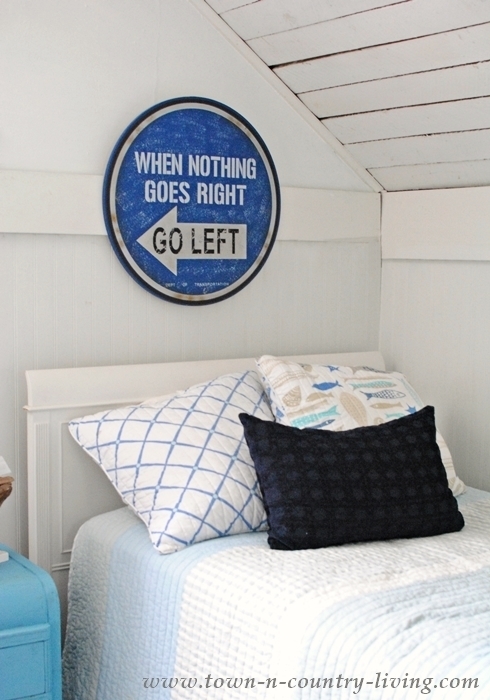 I decided to freshen up the space with a fresh coat of paint and turn it into a coastal style bedroom for guests. The most frequent of our guests is my grandson who helped with some of the decorating. When we moved into this old house, my son’s bedroom was the first room I wallpapered. Since then, I’ve ripped the wallpaper down and added bead board and trim. The under-the eaves ceiling had the lathe wood you see here, but I gave it a coat of white wash several years ago. The room is small, and painting the walls white (2 days before my son’s wedding) was the last step in brightening up this small bedroom. Since there’s a lot of trim and angles in the bedroom, I decided to use FrogTape® brand painter’s tape to avoid slobbering all over the trim. 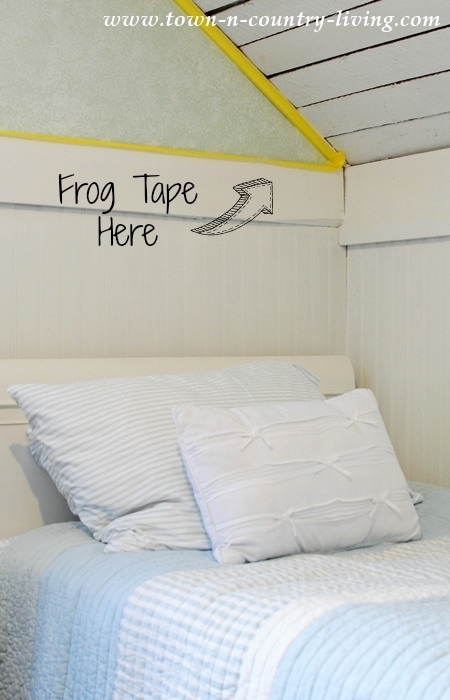 I love Frog Tape because it’s the only painting tape that’s treated with PaintBlock®, which reacts to water in latex paint and instantly gels to create a barrier. This means the paint isn’t going to bleed under the tape and you’ll end up with super crisp, straight lines. 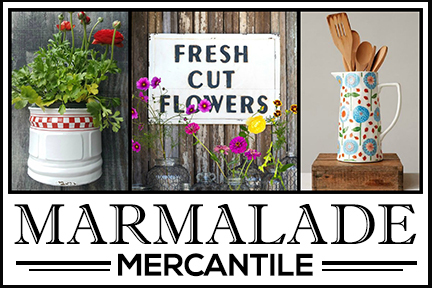 You’ll notice the 2 types of Frog Tape: Delicate Surface and Multi-Surface. I used the Multi-Surface in my son’s room. 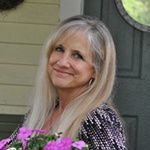 It’s a multi-purpose tape with medium adhesion that removes cleanly for up to 21 days. 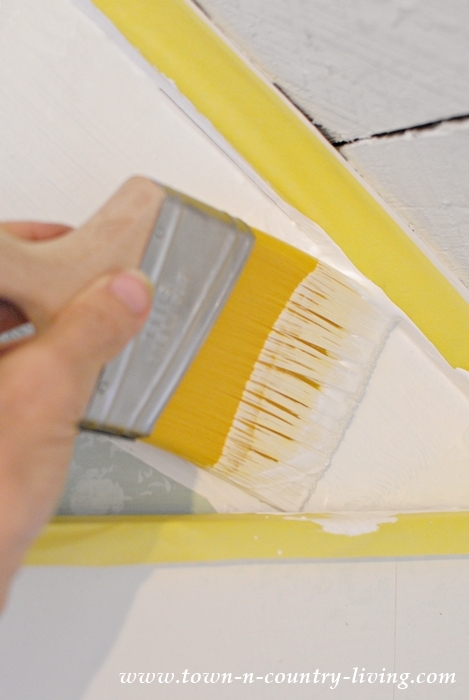 Delicate Surface tape is perfect when painting trim next to wallpaper. It has light adhesion so it won’t ruin your wallpaper when taping over it. This tape is also a good choice for faux paint surfaces. Here’s a perfect example of the angles and corners in my son’s under-the-eaves bedroom. I’ve never been able to paint that triangular corner without creating a mess … that is, until I decided to use Frog Tape. Before painting, the wall above the bead board was an ugly mint green that I sponge painted. I don’t know what I was thinking. I never liked it. Now I can get close into that corner with my paint brush and it doesn’t matter that I slobber on the tape. 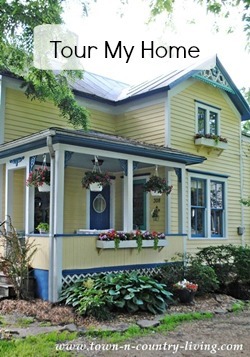 Since we’re hoping to sell our house next spring, I chose a shade of white for the walls. There’s only one small window in this room so the white walls helps to bounce the light around. 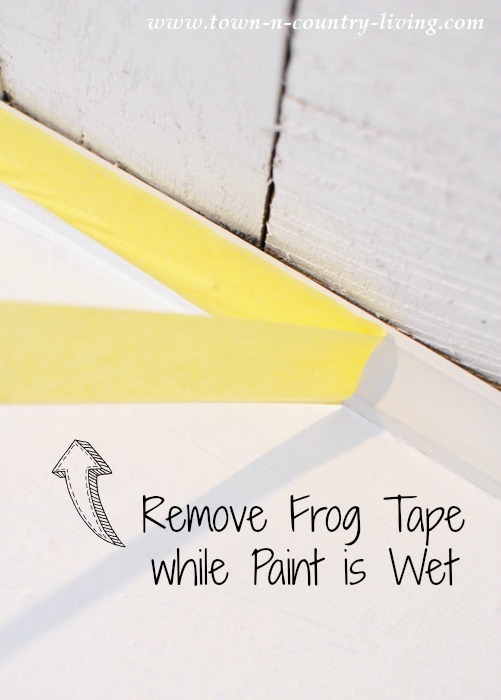 When using Frog Tape, you want to remove the tape while your paint is still wet. Although both my walls and trim are white, they’re slightly different shades and I wanted to ensure a clean, straight line. 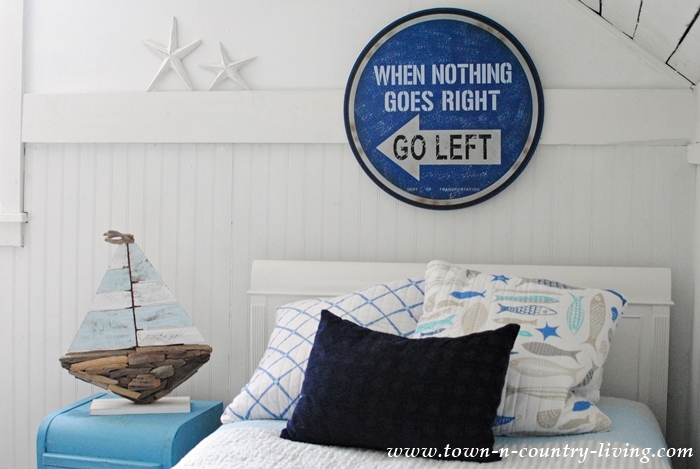 Once the walls were painted, my grandson and I started decorating to create a coastal style bedroom. He’s staying at our house for a month this summer and this has become his new bedroom. I have to say, I love all the white! The blue colors in the room really pop in here. 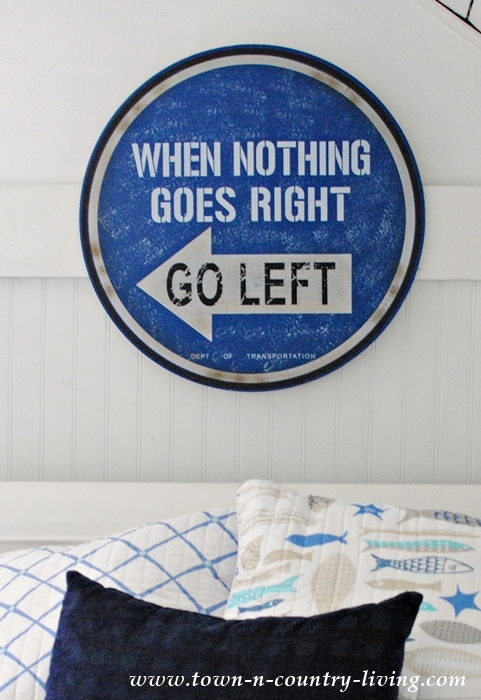 Aiden found this fun sign when we were out shopping and suggested we get it for the bedroom. I love that we were able to personalize the room with something he found. It will make me think of him every time I see it. 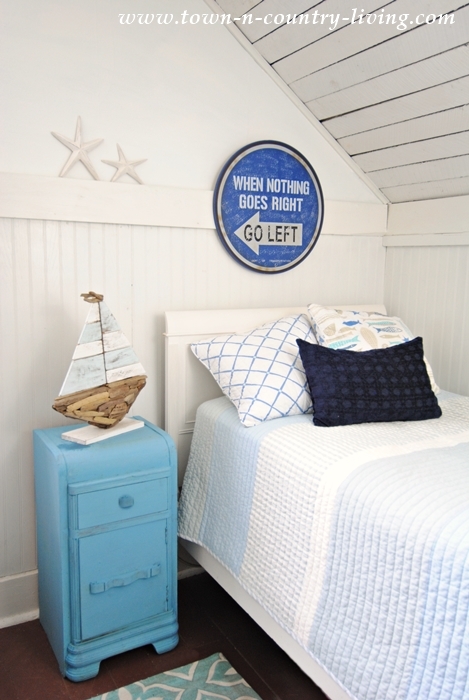 Wooden starfish perch on the molding above the little blue nightstand decorated with a driftwood sailboat. I love the transformation of this coastal style bedroom so far and will share more of it in the near future. I’m still working on the finishing touches. 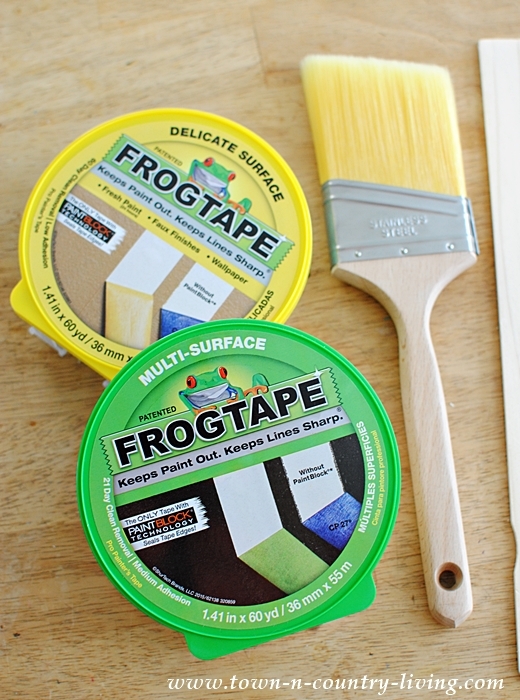 Using Frog Tape helped the painting process go much quicker and it was so easy to use! 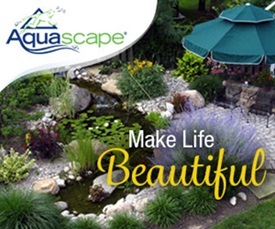 You can find FrogTape® painting inspiration for your own upcoming projects. Cute room without being fussy! Crisp blue and white is just perfect. I thought I was the only person who uses the word “slobber”. ha! Very nice bedroom! What fun to have your grandson help you decorate and spend time with you this summer. Congrats to your son on his new marriage. This makes a beautiful living area and that makes the best out of bedrooms and the painting should be such as it makes the master bedroom look pretty enough. Such style in a bedroom makes it look prettier.